I came home early on a Friday. It had been a tough week with lots of setbacks, but with the prospect of a relaxing weekend ahead, I tried to put all other thoughts out of my mind. As I wandered through our little grocery store, a plan starting forming in my head for a nice Friday night dinner. We would start with cheese gougères and a French 75 cocktail that I had been dying to make. The main course would be a carrot soufflé with a shaved beet salad; we already had a whole pile of carrots and beets from our weekly vegetable delivery so there wasn’t much to buy. We also had a very ripe mango that needed to be eaten. I could picture the mango lying on a bed of whipped cream in a puff pastry for dessert, but it needed something else. I looked around and smiled as I grabbed a package of dark purple blackberries. Perfect. I had already bought the frozen puff pastry when I remembered it was Pi(e) month. I should totally make a pie instead. But wouldn’t mango get all mushy and disappear if baked inside a pie? And filling a whole pie shell with whipped cream just doesn’t make sense. The pie would have to be cold and would have to have another filling too. My mind strayed to the pastries of Paris on our honeymoon; it had to be pastry cream. I threw on my apron and set to making the pie crust that had to rest for at least two hours before using. It was my second time making the Serious Eats pie crust. As before, I looked skeptically at the pile of crumbs inside the bowl as I sprinkled in water, folding and flattening with my rubber spatula. But the whole mess came together and I wrapped the discs in plastic and placed them in the fridge. Later that night, with two unexpected guests, I sliced into the creamy pie center. The satisfied noises told me that I had made all the right choices. “I could eat this crust by itself as a cookie,” one friend stated. 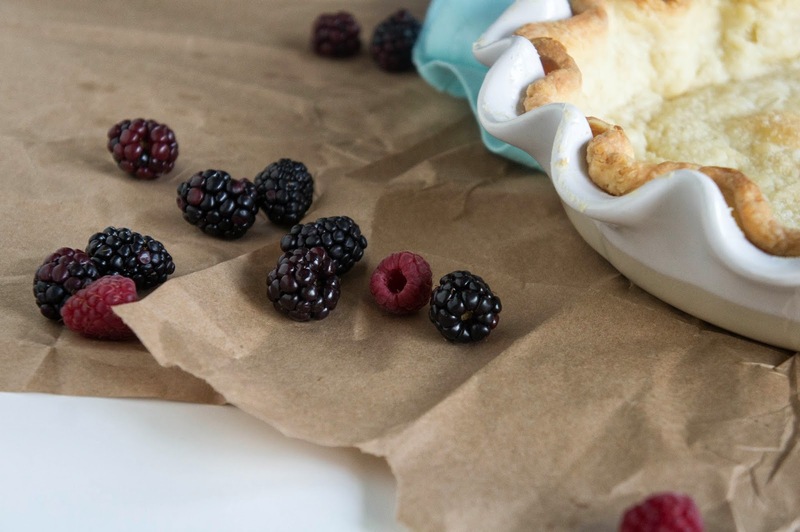 The perfect description of the perfect pie crust. 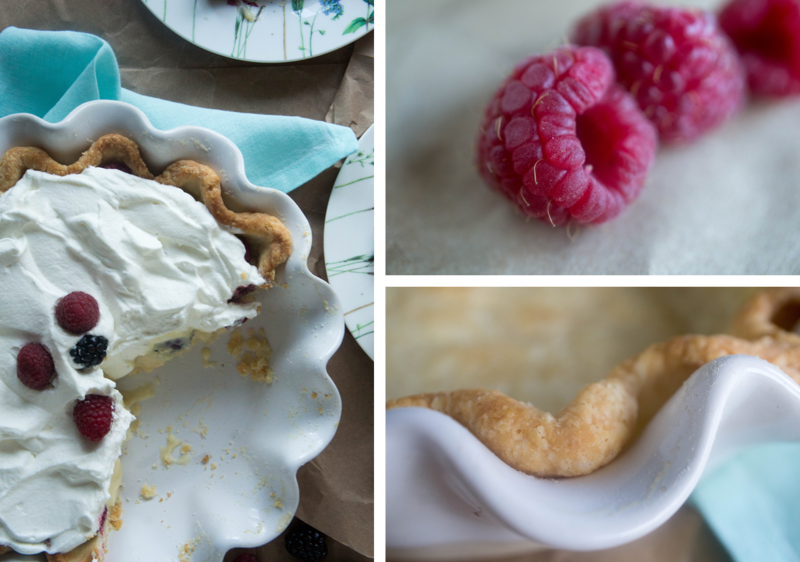 There’s no mango in these pictures because I already made this pie again with raspberries and blackberries. All-butter, tender, and flaky, I am looking forward to filling this crust with all sorts of things throughout the year. In a food processor, combine 8 oz of the flour with the sugar and salt. Pulse to combine. Scatter butter pieces evenly over the flour. Pulse until no dry flour remains and dough begins to clump together, about 25 pulses. 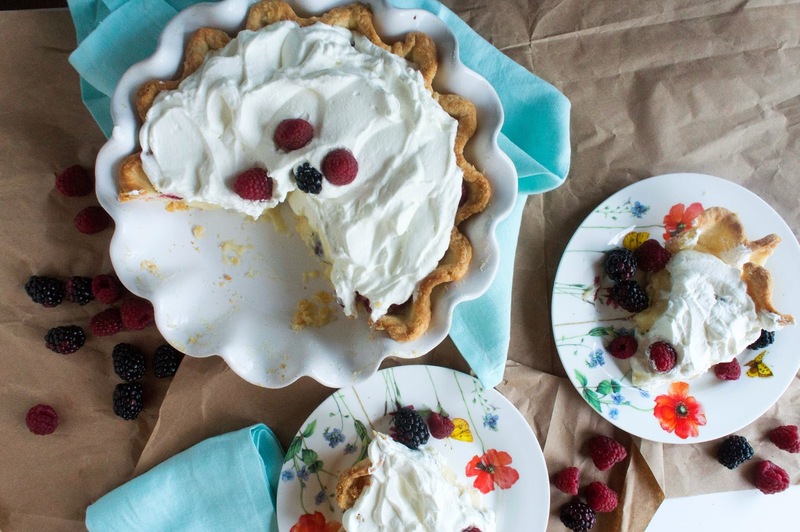 Yes, this is different than what every other pie crust recipe tells you to do. Trust the science. Sprinkle the remaining 4.5 oz of flour over the dough. Pulse until dough is barely broken up, about 5 more times. Do not over mix at this point. The dough will seem fairly dry, but that’s because there is flour coating the sticky parts. Dump everything into a large bowl. Sprinkle water over top. Using a rubber spatula, fold and press the dough until it comes together into a ball. Do not use your hands, they are likely too warm. Divide into two even pieces and form into discs. Wrap tightly in plastic wrap and let rest in the fridge for at least 2 hours or overnight. 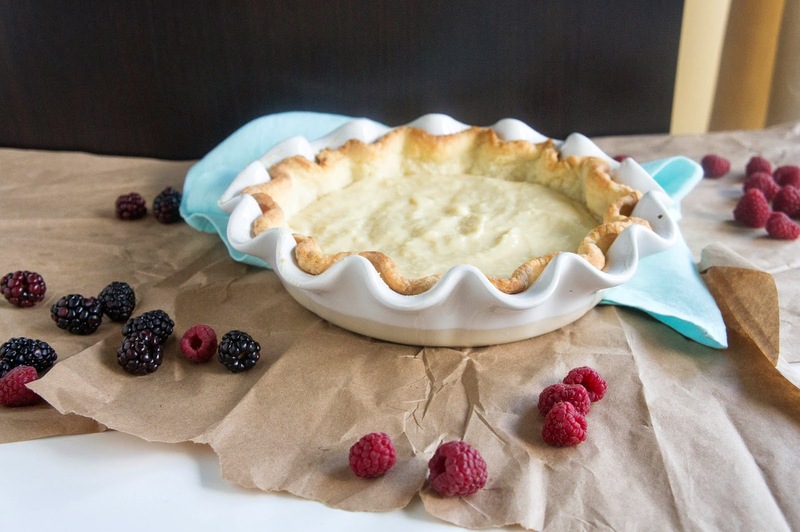 You can make the pastry cream while you wait. When dough is ready, preheat the oven to 425F. 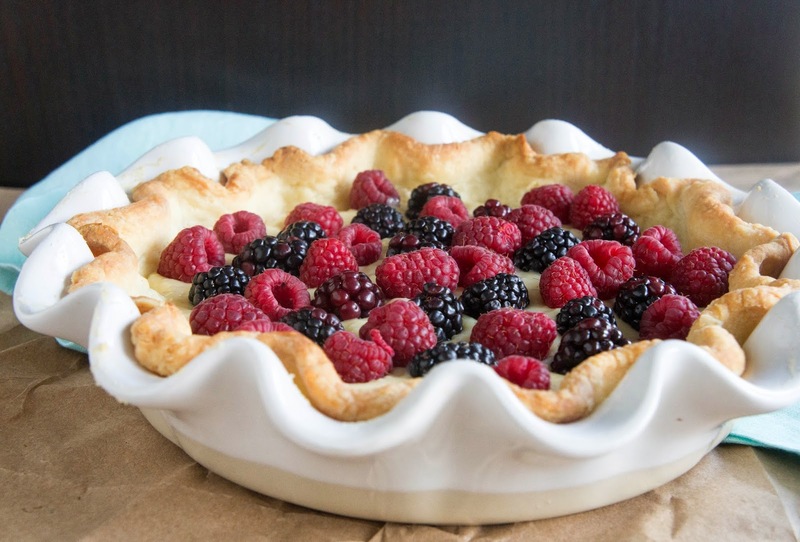 Roll out the pie crust on a lightly floured surface so that it is slightly larger than your pie pan. Transfer the crust to the pie and trim or fold the edges so the crust fits. At this point you can flute or otherwise fancy up the edges. I use my fingers to pinch the edges into nice ruffles. Line the crust with parchment paper making sure it is flush with the edges and fill with pie weights or dry beans or rice. I keep a jar of beans and rice specifically for blind baking and reuse them. Bake in the middle of the preheated oven for 12-15 minutes, or until edges of the pie are barely golden. Remove the parchment paper carefully (the beans or pie weights are hot!). Return to the oven for another 7-9 minutes or until the edges are browned and the bottom is lightly golden. In a large bowl, whisk together eggs, vanilla, sugar, and cornstarch until smooth. The cornstarch will settle a bit while the milk heats, re-whisk quickly before adding the milk. In a medium saucepan, heat milk until just boiling. Whisking constantly, slowly pour hot milk into egg mixture until combined. Pour the whole mixture back into the saucepan and heat again until thickened, about 30 seconds. If the mixtures becomes chunky, purée in a blender or with an immersion blender until smooth again. No biggie. Pour into a bowl and cover the surface directly with plastic wrap. Let cool completely. Just before assembly, whip the cream with the sugar and vanilla until firm peaks form. 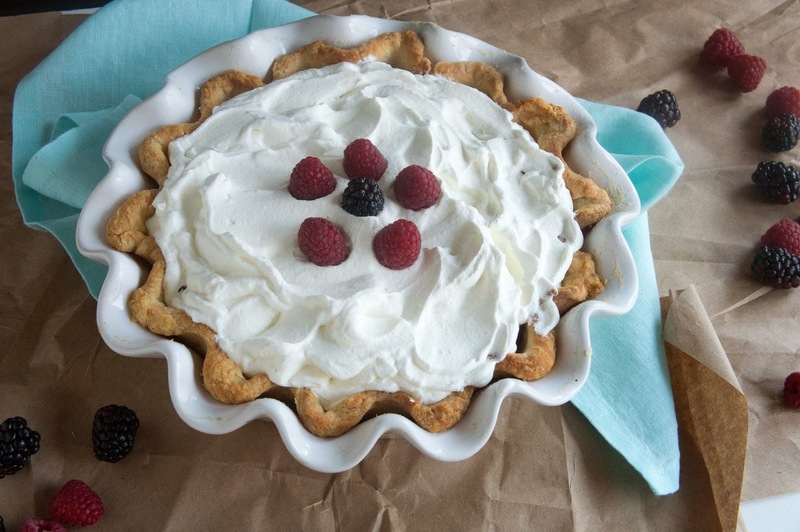 Spoon pastry cream into pie crust and level. 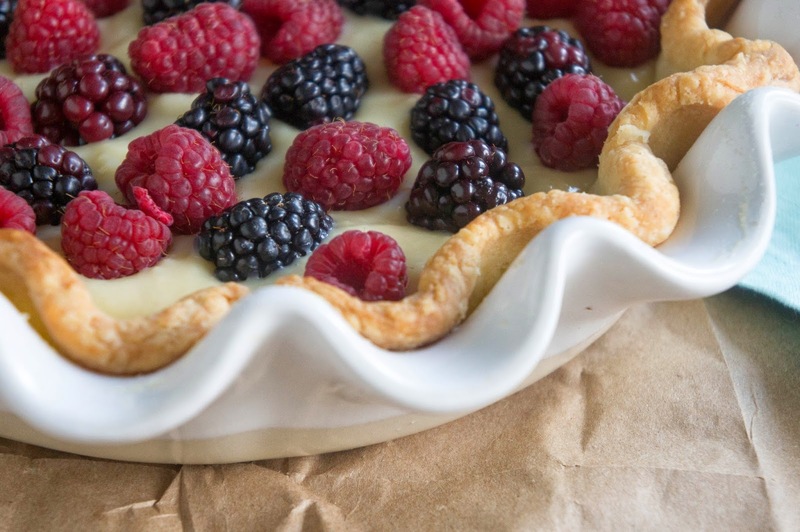 Arrange fruit over pastry cream, saving some for decoration on top if desired. 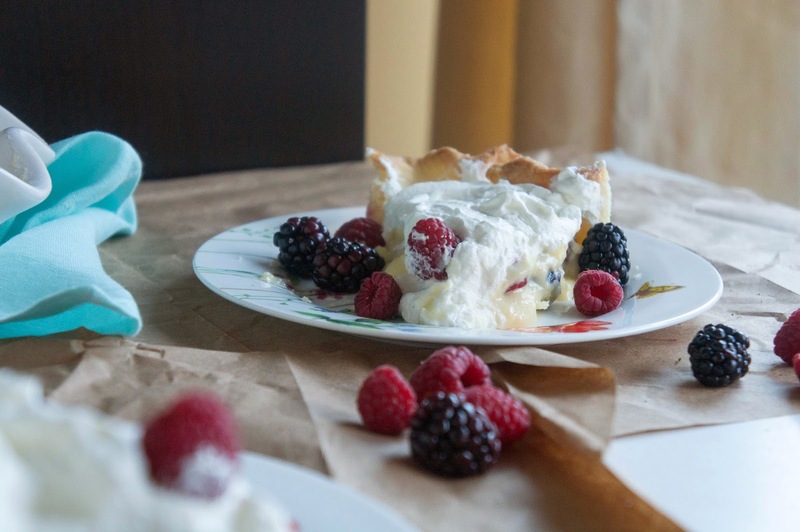 Spread whipped cream over fruit. Decorate with any remaining fruit. Chill until ready to serve. Best served the day it is made. so happy I got to be an unexpected guest!